In 2019 the video game industry is expected to grow to $180 billion worldwide. In the UK alone in 2017 the consumer spend on games was £5.11 billion – up 12.4 per cent from the previous year. Gaming is now on a par with the music and film industries, and yet it is all but ignored by traditional broadcasters. Despite gaming being the most popular genre of video on YouTube, producers don’t seem to know how best to put games on TV, even as they lose ground to the likes of Pewdiepie. Channel 4’s recent Playing With Time failed to meet the expectations of its audience, Dave’s popular Go 8-Bit has been cancelled, and there hasn’t been a proper gaming series on British terrestrial TV since GamesMaster ended in the late-90s. When Paul Rose (AKA Mr Biffo)– a veteran games journalist and BAFTA-nominated writer with 20 years experience working in TV – grew tired of broadcasters refusing to make a proper games show, he took it upon himself to create a YouTube series with the sorts of production values normally reserved for TV budgets; something leagues more ambitious than the usual online offerings. Raising over £44,000 on Kickstarter earlier this year, Rose has produced Digitiser – inspired by the legendary Teletext games magazine he created 25 years ago with travel writer Tim Moore. 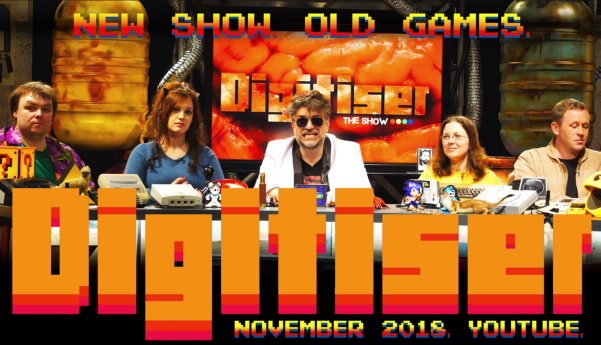 With a focus on the golden age of gaming, Digitiser now aims to prove to broadcasters that there is an audience for gaming TV, and that it can be done in a way that is accessible and entertaining in its own right, without alienating a core gaming audience. It’s a show for everyone, that just happens to be about video games, according to Biffo. Digitiser will comprise of six episodes featuring “gaming mayhem and anarchic comedy”, with games, challenges, sketches and debates that span formats and decades. It’s irreverent, original, and wildly ambitious – and it hits YouTube on November 11th. Digitiser has a point to prove: that creators no longer need TV people to make TV-quality shows. Guests across the series include some of the most popular creators on YouTube – Ashens, Nostalgia Nerd, Kim Justice, DJ Slope and more – along with guests including Steve McNeil – the star and creator of Go 8-Bit – top stand-up comics Imran Yusuf and John Robertson, and 90s gaming icon Big Boy Barry. Hosted by Rose, along with Larry Bundy Jr (whose own channel has almost 350,000 subscribers), rising YouTube stars Gameplay Jenny and Octav1us, and comedian Paul Gannon, Digitiser: The Show is a shamelessly irreverent and anarchic delve into the gaming archives, best described as a sort of “Tiswas for video games” says its creator – with the same broad appeal as Top Gear. The Digitiser YouTube channel can be found here.